A recent weekend of quality food started in Bristol with a visit to Casamia. I’d wanted to make the trip here for sometime as I’d heard good things from other bloggers about this 1 Michelin Star establishment. It sits a little outside of the city centre and has a light, modern dining area with an open kitchen. Their full tasting menu will set you back £68 or £88 depending on if it’s the weekend or not. There is also a shorter lunch offer priced at £38 which we chose. A couple of initial nibbles were good, a mushroom tart light and delicate though it was eclipsed by some excellent home-smoked trout. The classic beetroot and goats cheese combination was the first proper course. The several different textures of the vegetable were skilfully done and the whipped cheese added a luxurious touch. The “main” of guinea fowl was cooked very well , though lacked a little excitement. Celery root was a new one on me, the earthiness worked well with the bird and a jus was very good so I couldn’t really fault it. A bit of drama did come with the next course that was a segway between savoury and sweet. Sticky, smoked butternut squash with a herb granita that produced a dry ice effect in the bowl. 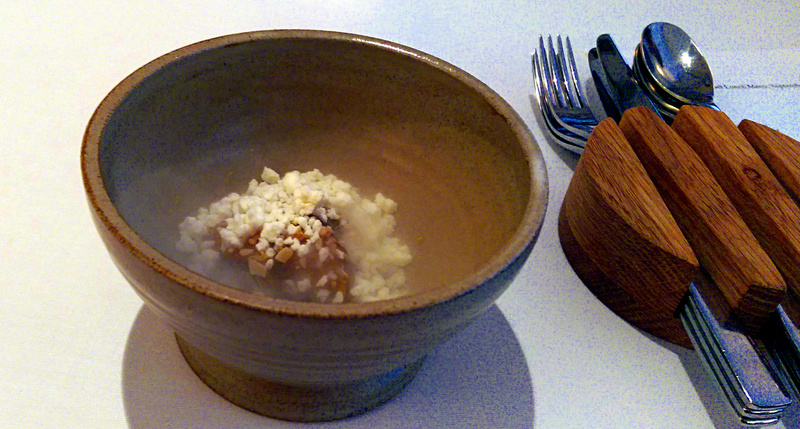 The dish wasn’t quite balanced though, very sweet and the majority of textures very soft. Much better was “Collection of apples” that had many incarnations of the humble fruit. A skilfully made sorbet was the focal point of the pretty plate, both a sweetness and sharpness of the apples coming to the fore in a dish that was well balanced. A couple of final nibbles arrived as petit fours (though we didn’t actually have coffee). A little thyme cake with chocolate was seriously good. The difficult balance of flavours was successfully done resulting in one of the tastiest mouthfuls I’ve had for a while. For £38 you can’t really argue at the value of the lunch menu at Casamia. Being picky there could have been a little more meat/fish dishes but clearly they economise on these for the cheaper menu. Everything was technically good, however was there anything I will remember in a few months time? I’m not sure. If I lived closer to Bristol I can imagine making a trip regularly, from Nottingham I don’t think there’s quite enough to make a special trip. Coming next, the second part of my weekend at Nathan Outlaw’s new Port Isaac location.